A weaker U.S. dollar is good news for airlines outside the United States. 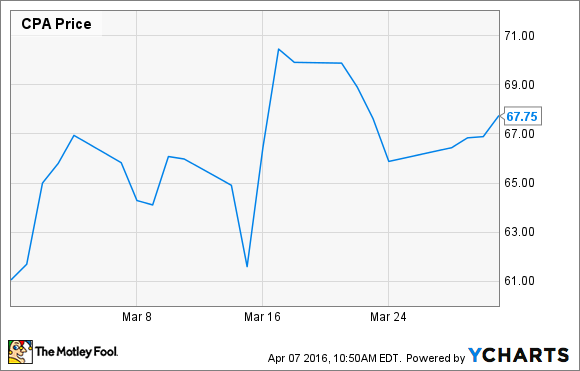 Copa Airlines shares had a good March. Image source: Wikimedia Commons user Jewbask. What: Shares of Latin American airline company Copa Holdings (NYSE:CPA) have lost more than half of their value since peaking in 2014. However, Copa stock has started to recover, rising 11% last month, according to data provided by S&P Global Market Intelligence. So what: Since the middle of 2014, the U.S. dollar has risen significantly against most foreign currencies. The dollar's rise was catalyzed by comparatively strong economic conditions in the United States. AMEX Dollar Index Performance. Data by YCharts. A rising dollar is bad for airlines outside the U.S., because it drives up their costs. Key input costs like jet fuel, airplanes, and spare parts are priced in dollars -- and increases can't always be passed through to customers. The steep drop in oil prices since mid-2014 has taken the sting off the dollar's rise for foreign airlines, but they have not profited from cheap oil like U.S. airlines have. The U.S. dollar began another move higher last fall as traders anticipated the Federal Reserve's decision to hike interest rates in December. However, market turmoil and sluggish economic growth have forced the Fed to rethink its plans for tightening monetary policy. On March 16, the Fed announced that it would hold rates steady and that policymakers now expected to raise rates twice during 2016, down from an initial projection of four rate hikes. This news erased most of the U.S. dollar's gains from the previous few months. 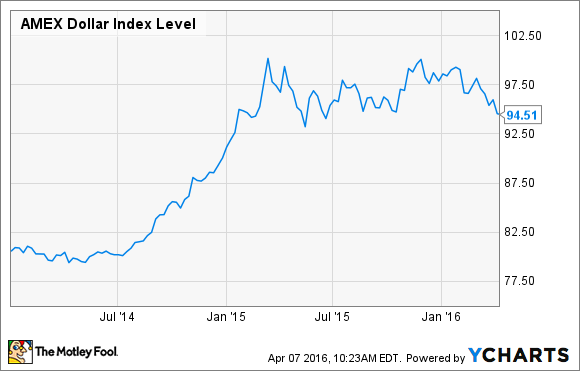 The weaker dollar is great news for Copa shareholders. As a result, the stock jumped 14% in the two days surrounding the Fed announcement last month. Copa Holdings March Stock Performance. Data by YCharts. Now what: Exchange-rate movements are notoriously hard to predict -- it's anybody's guess whether the dollar will rebound or continue to sink from here. As a result, the dollar's recent decline is no reason to go load up on foreign airline stocks. That said, while Copa has faced challenging conditions in the past year, it is one of the few airlines in Latin America with a track record of consistent profitability. That offers at least some hope that Copa will be able to handle whatever challenges come next.